One of Norfolk & Western's finest designs, these articulateds featured all the latest components when introduced in the late 1930s. After two appeared for trials (1200-1201), eight more followed in 1936-1937. N&W erected 25 more during World War II (using Alligator crosshead guides), and eight more in 1949-1950. They were delivered with tenders carrying 26 tons (23.6 tonnes) of coal. Between Williamson, WV and Portsmouth, Ohio, these engines had a tonnage rating of 13,000 tons of slow freight. Between Portsmouth and Columbus, they were rated at 5,200 tons of time freight. And they could pull passenger trains at 70 mph (113 kph).. In addition to a high-pressure boiler, an A had a cast-steel frame and roller bearings on virtually all surfaces. The firebox had 57 sq ft (5.30 sq m) of arch tubes and a long combution chamber, but no circulators or syphons. The last five of the type had McGill MultiRol roller bearings in the side and main rods, the only articulateds to take such friction-reducing measures. According to the unnamed fineartmodels author, N&W studies showed that an auxiliary tender (known as a "canteen" on the railway) would "eliminate the need for some water stops and increase gross ton-miles per train hour (GTM) 31 percent on the 112-mile Kenova District between Williamson and Portsmouth, Ohio." So the railway converted many 16,000 gallon tenders. As far as Locobase can tell from the 1957 diagram, elminating the coal space increased capacity to 20,800 gallons (78,728 litres). Light weight was 108,000 lb (48,988 kg) and loaded weight with that gallonage came to 281,400 lb (127,641 kg). Overall power system weight (engine, tender, and auxiliary water tender) topped out at 1,233,000 lb (559,280 kg). 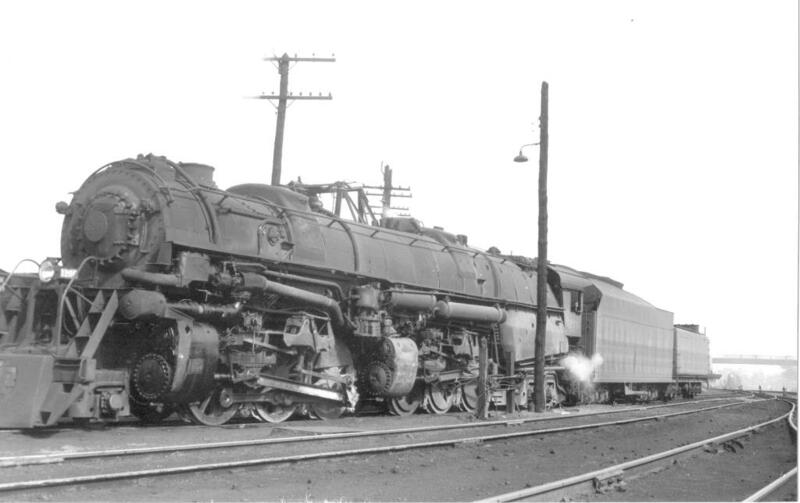 Over the Kenova District, the N&W increased the As' tonnage ratings from 13,000 to 14,500 tons. Engine designs like these offer the best support for the contention that steam could equal diesel in cost-effective rail transport, but no other railroads could offer the combination of home-grown talent, facilities, and relatively cheap coal possessed by the N&W. Ultimately, even the N&W had to relent. All the As were retired in 1958-1959. NB: Robert Le Massena contended that this group had several traction-boosting differences that weren't publicized, such an increase in boiler pressure to 315 psi, drivers shrunk by half an inch to 69 1/2", and cylinders bored out to 24 1/2". The smokebox was insulated, valve gear pivoted on needle bearings, circulating tubes improved heating in the firebox. Total weight on the drivers increased 42,000 lb to 475,000 lb. Cutoff remained at 75%.